Northern Tablelands MP Adam Marshall discussing the new funding for the Delungra Recreation Ground with Trustees Jill Brown, left, and John Burt. FOR more years than they care to remember, the committee running the Delungra Yard Dog Trials have had to beg and borrow sheep yard panelling required to stage the annual dog trial event. But now, thanks to a $15,000 NSW Government grant, the committee can now purchase and install a permanent set of yards and race for the event. Northern Tablelands MP Adam Marshall visited Delungra over the weekend to deliver the good news to Delungra Recreation Ground Trustees and committee members. “Over the past few years, I’ve had the pleasure of helping the Delungra Recreation Grounds Trust make huge improvements to the grounds with various grants but this funding has been welcomed with a huge sigh of relief,” Mr Marshall said. “To stage their annual yard dog trials, the committee has had to beg and borrow all the panelling, transport it to the grounds, build the yards and then when the event is over, pull it all down and return the panelling to the donors. Mr Marshall said the Delungra Recreation Reserve Trust and the various user groups had done a magnificent job over the years upgrading and maintaining the town’s recreation grounds. Delungra Recreation Reserve Trustee Jill Brown said the job of erecting the yards each year was labour intensive and they were thrilled with the prospect of making the yards a permanent feature of the grounds. 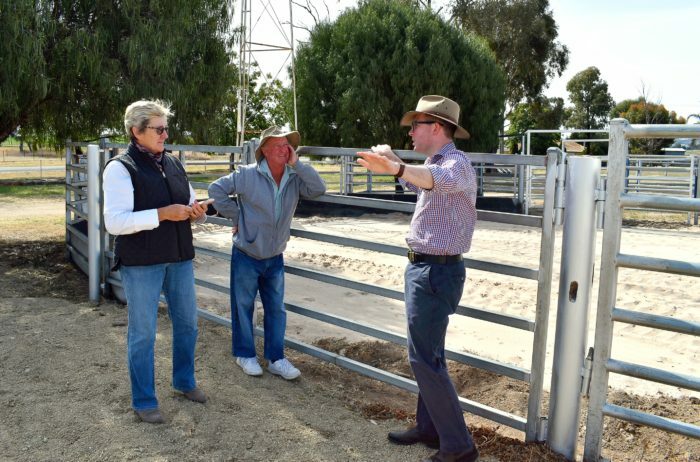 “We are hoping to stage the NSW Yard Dog Trials in Delungra next year and since we will have permanent yards, we will feel a lot more confident about applying to the event,” Mrs Brown said.